(p. C1) David Sokol, once widely expected to succeed Mr. Buffett as chief executive of Berkshire Hathaway Inc., has kept a fairly low profile since leaving the conglomerate amid a stock-trading controversy five years ago. In addition to becoming a more-vocal investor, Mr. Sokol, 59 years old, is becoming increasingly vocal about politics. He is an avowed fan of “Atlas Shrugged,” the 1957 novel by Ayn Rand that made a moral case for capitalism and self interest. In public speeches and columns, Mr. Sokol has drawn comparisons between the dystopian, over-regulated America portrayed in the book and the present day, saying (p. C2) that free enterprise is increasingly under attack. SERENA NG and ANUPREETA DAS. “From Buffett Protege to Activist.” The Wall Street Journal (Mon., April 25, 2016): C1-C2. Rand, Ayn. Atlas Shrugged. New York: Random House, 1957. (p. B4) Say what you will about Plain Old Telephone Service, but it worked. The functionality of POTS, as it was known, was limited to making calls, and they were expensive. But many traditional phone companies offered 99.999% reliability, which allowed for about five minutes of downtime a year. Today’s networks are far less expensive, infinitely more capable and nowhere near as reliable as the wired-to-the-wall phone, . . .
To some extent, contemporary networks suffer from inattention. The old phone system worked so well because regulators in certain countries like the U.S. said it had to, and enough money was set aside to fund an army of technicians and engineers to oversee it. That generally isn’t the case with modern, digital networks and IT infrastructure, and companies often neglect this nuts-and-bolts technology. Underneath it all, the economics of falling prices carry a trade-off. Consumers get more for their money in the mobile, digital era, but that often leaves margin-stretched companies with fewer resources to invest in robustness and maintenance. Reliability is as much a function of business and risk management as it is about tech. “I don’t know if people are sweating that detail as much as they used to,” said Mr. Bayer, previously CIO of the Securities and Exchange Commission. Former NYSE Euronext Chief Operating Officer Lawrence Leibowitz told the Journal in 2013 the public shouldn’t expect market technology to function perfectly, a goal that would be too expensive to implement even if it were technically feasible. STEVE ROSENBUSH and STEVEN NORTON. “Network Reliability, a Relic of Business?” The Wall Street Journal (Fri., July 10, 2015): B4. “Dr. 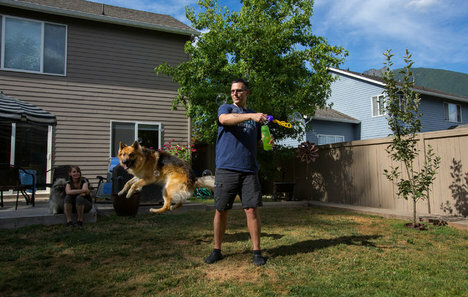 Matt Kaeberlein, a biology of aging researcher, with his dog Dobby in North Bend, Wash. He helped fund a drug study using his own money.” Source of caption: p. A12 of print version of the NYT article quoted and cited below. Source of photo: online version of the NYT article quoted and cited below. (p. A12) But scientists who champion the study of aging’s basic biology — they call it “geroscience” — say their field has received short shrift from the biomedical establishment. And it was not lost on the University of Washington researchers that exposing dog lovers to the idea that aging could be delayed might generate popular support in addition to new data. The idea that resources might be better spent trying to delay aging rather than to cure diseases flies in the face of most disease-related philanthropy and the Obama administration’s proposal to spend $1 billion on a “cancer moonshot.” And many scientists say it is still too unproven to merit more investment. The National Institutes of Health has long been organized around particular diseases, including the National Cancer Institute and the National Institute of Diabetes and Digestive and Kidney Diseases. There is the National Institute on Aging, but about a third of its budget last year was directed exclusively to research on Alzheimer’s disease, and its Division of Aging Biology represents a tiny fraction of the N.I.H.’s $30 billion annual budget. That is, in part, because the field is in its infancy, said the N.I.H. director, Dr. Francis Collins. Over 1,500 dog owners applied to participate in the trial of rapamycin, which has its roots in a series of studies in mice, the first of which was published in 2009. Made by a type of soil bacterium, rapamycin has extended the life spans of yeast, flies and worms by about 25 percent. But in what proved a fortuitous accident, the researchers who set out to test it in mice had trouble formulating it for easy consumption. As a result, the mice were 20 months old — the equivalent of about 60 human years — when the trial began. That the longest-lived mice survived about 12 percent longer than the control groups was the first indication that the drug could be given later in life and still be effective. Dr. Kaeberlein said he had since achieved similar benefits by giving 20-month-old mice the drug for only three months. (The National Institute on Aging rejected his request for funding to further test that treatment.) Younger mice, given higher doses, have lived about 25 percent longer than those not given the drug, and mice of varying ages and genetic backgrounds have been slower to develop some cancers, kidney disease, obesity and symptoms of Alzheimer’s disease. In one study, their hearts functioned better for longer. “If you do the extrapolation for people, we’re probably talking a couple of decades, with the expectation that those years are going to be spent in relatively good health,” Dr. Kaeberlein said.
. . . what dog lovers have long considered the sad fact that their pets age about seven times as fast as they do, Dr. Kaeberlein knew, would be a boon for a study of rapamycin that would have implications for both species. An owner of two dogs himself, he was determined to scrounge up the money for the pilot phase of what he and Dr. Promislow called the Dog Aging Project. Last month, he reported at a scientific meeting that no significant side effects had been observed in the dogs, even at the highest of three doses. And compared with the hearts of dogs in the control group, the hearts of those taking the drug pumped blood more efficiently at the end. The researchers would like to enroll 450 dogs for a more comprehensive five-year study, but do not yet have the money. Even if the study provided positive results on all fronts, a human trial would carry risks. Dr. Kaeberlein, for one, said they would be worth it. AMY HARMON. “CHASING IMMORTALITY; Dogs Test Drug Aimed at Humans’ Biggest Killer: Age.” The New York Times (Tues., MAY 17, 2016): A1 & A12. Gorbunova, Vera, Michael J. Bozzella, and Andrei Seluanov. “Rodents for Comparative Aging Studies: From Mice to Beavers.” Age 30, no. 2-3 (June 25, 2008): 111-19. (p. B1) KEADBY, England — A wind farm here, along the River Trent, cranks out enough clean electricity to power as many as 57,000 homes. Monitored remotely, the windmills, 34 turbines each about 400 feet high, require little attention or maintenance and are expected to produce electricity for decades to come. “They’re very well behaved,” said Sam Cunningham, the wind farm’s manager, as she drove around the almost three-square-mile site. The owner of the wind farm, the British electricity company SSE, has been betting big on turbines as well as other renewables for years, with multibillion-dollar investments that have made the utility the country’s leading provider of clean power. In theory, last year’s United Nations climate accord in Paris should have been a global validation of the company’s business strategy. But instead of doubling down, the utility is rethinking its energy mix, reconsidering plans for large wind farms and even restarting a mothballed power plant that runs on fossil fuel. STANLEY REED. “Clean Power Muddied by Cheap Fuel.” The New York Times (Sat., FEB. 20, 2016): B1 & B5. (p. C1) OXFORD, England — After the murders at Charlie Hebdo last year, the public intellectual Timothy Garton Ash — once a dashing foreign correspondent, long since a scholar amid the spires of Oxford — issued an appeal to news organizations: Publish the offending cartoons, all of you together, and in that way proclaim the vitality of free speech. By this reckoning, the assassins triumphed, for most publications ignored his entreaty, to protect their staffs from danger or to protect their readers from offense.
. . . , free speech is on the defensive, Mr. Garton Ash argues, and he is trying to rally the resistance. (p. C4) . . . , he has written a scrupulously reasoned 491-page manifesto and user’s guide, “Free Speech: Ten Principles for a Connected World,” due out in the United States on Tuesday [May 24, 2016] which includes his case for defying threats, his opposition to hate-speech laws and his view on whether another’s religion deserves your respect. A vulnerability of Mr. Garton Ash’s project is that his principles are so deeply rooted in Enlightenment ideals, which are not universally shared. TOM RACHMAN. “A Manifesto Extolling Free Speech.” The New York Times (Mon., MAY 23, 2016): C1 & C4. Ash, Timothy Garton. Free Speech: Ten Principles for a Connected World. New Haven, CT: Yale University Press, 2016. To the extent that bad luck, and periodically recurring natural causes, explain species extinctions, the role of humans in causing extinctions may be less than is sometimes assumed. (p. A21) Dr. Raup challenged the conventional view that changes in diversity within major groups of creatures were continuous and protracted, and advanced the theory that such changes can be effected by random events. And he questioned the accepted notion that biodiversity — that is, the number of extant species — has vastly increased over the past 500 million years, pointing out, among other things, that because newer fossils embedded in newer rock are easier to find than older fossils in older rock, it is possible that we simply have not uncovered the evidence of many older species whose existence would undermine the theory. His conclusion, that the data of the fossil record does not allow the unambiguous presumption that biodiversity has increased, has profound implications. Dr. Raup’s most famous contribution to the field may have been the revelation in 1983, after a six-year study of marine organisms he conducted with J. John Sepkoski Jr., that over the last 250 million years, extinctions of species spiked at regular intervals of about 26 million years. Extinction periodicity, as it is known, enlivened the study of huge volcanic eruptions and of changes in the earth’s magnetic field that may have coincided with periods of mass extinction. It has also given rise to numerous theories regarding the history of life, including that the evolution of myriad species has been interrupted by nonterrestrial agents from the solar system or the galaxy. BRUCE WEBER. “David M. Raup, Who Transformed Field of Paleontology, Dies at 82.” The New York Times (Thurs., JULY 16, 2015): A21. (p. 9) The squids are all right — as are their cephalopod cousins the cuttlefish and octopus. In the same waters where fish have faced serious declines, the tentacled trio is thriving, according to a study published Monday [May 23, 2016]. Dr. Doubleday and her team compiled the first global-scale database of cephalopod population numbers, spanning from 1953 to 2013. “When we looked at the data by cephalopod group we were like ‘Oh my God — they’re all going up,’ ” she said. She said it was remarkable how consistent the increases were among the three cephalopod groups, which included species that swim in the open seas and creatures that scuttle through tide pools. They published their findings in the journal Current Biology. NICHOLAS ST. FLEUR. “One Resident of the Sea, Unlike Many, Is Thriving.” The New York Times (Weds., MAY 25, 2016): A7. Doubleday, Zoë A., Thomas A. A. Prowse, Alexander Arkhipkin, Graham J. Pierce, Jayson Semmens, Michael Steer, Stephen C. Leporati, Sílvia Lourenço, Antoni Quetglas, Warwick Sauer, and Bronwyn M. Gillanders. “Global Proliferation of Cephalopods.” Current Biology 26, no. 10 (Mon., May 23, 2016): R406-R07.